← Time to sign up for the Holiday Show! Deadline is October 31st to apply for Magic City Art Connection! *Booth fee choices include $175 + 10% commission, $275 flat for a single booth, $425 flat for a corner booth, or $600 flat for a double booth. *Artist amenities include booth sitting, complimentary breakfasts, an artist rate at our host hotel, and a Friday night event. Join us for the 30th annual Magic City Art Connection (MCAC) on April 26-28. This highly anticipated contemporary art festival was recently voted the Best Art Festival in Birmingham Magazine’s reader poll for its Best of Birmingham September issue! Annually, MCAC welcomes 25,000 patrons and collectors to the city center for art, food & wine, and much more. 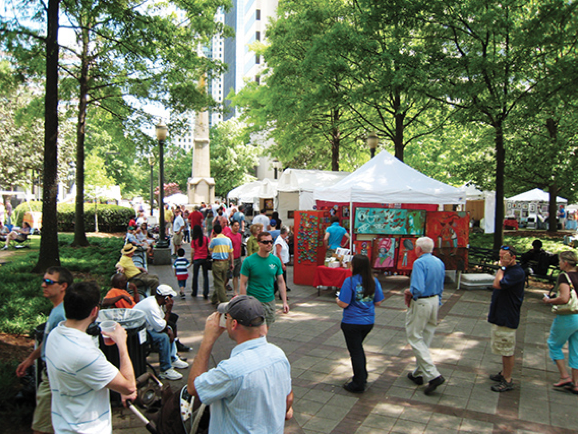 MCAC transforms historic Linn Park (adjacent to the Birmingham Museum of Art) with its blast of fresh artistic talent, sights, sounds, and aromas. The festival also boasts great support from the community including active corporate and individual sponsors. Media coverage is extensive as well with tv, radio, print, and web partners like Fox 6, Clear Channel Broadcasting, WBHM public radio, Birmingham Magazine, and al.com, to name a few. MCAC continues to promote its popular art purchase program to collectors. Artist sales at MCAC reached $400,000 in 2012, an increase from 2010 artist reporting. Pair that with unmatched artist hospitality which includes a complimentary artist breakfast all 3 days, catered artist & VIP Awards dinner on Friday evening, free parking, special artist discounts, and smiling volunteers and the choice is clear. At MCAC, artists are the heart of the festival, and it shows. We hope to see your application! Now Accepting Applications: Deadline: October 31, 2012 Notification: December 1, 2012 Booth fee due: Upon application. Please send separate checks for jury and booth fees. This entry was posted in Announcements, Artist News, Competitions and tagged Alabama, artists, Birmingham, competition, juried show, Magic City Art Connection, prizes. Bookmark the permalink.